The following titles are in preparation. 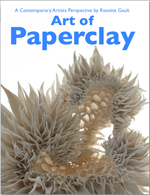 Survey recent developments, themes, and directions in forms paperclay ceramic forms worldwide. Many of the visions are impossible to build in traditional clay. The longing for expressive freedom has led to a collective advance and new views and paradigm. The concepts that artists explore in ceramics today merge science, physics, and social issues to result in vision and concern that cross international boundaries. ISBN: 978-0-9825736-4-8 on digital for ipad. Estimated 250 interactive color plates. Color prints can be made from pages as desired. A pdf version is also planned. 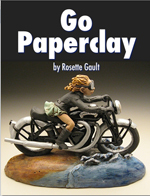 A visual collection of hand built sculptural and wheel work in ceramic paperclays from clay studios and kilns around the world. Ten chapters include one of a kind works and visions for home and garden. Works inspired by folk art, animal figures, tiles, outdoor, fantasy, pottery, and figure. Appendix with recipes and comments from artists.